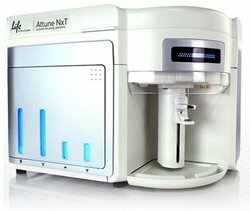 The Flow Cytometry Facility of the RadBioPhys Lab is equipped with a Thermo Fisher Attune NxT Acoustic Flow Cytometer (AFC). Violet laser (405nm, 50mW) with 4 channels (440/50nm, 512/25nm, 603/48nm, 710/50nm). Acquisition and analysis through Attune NxT software 2.6. RadBioPhys Lab routinely performs cellular analysis (DNA content, Cell death assay, Proliferation Assay) and immunophenotype assays (from 2 to 8 colors analysis).